I'd like to let it be known that this is the very first graham cracker gingerbread house that I have ever made. 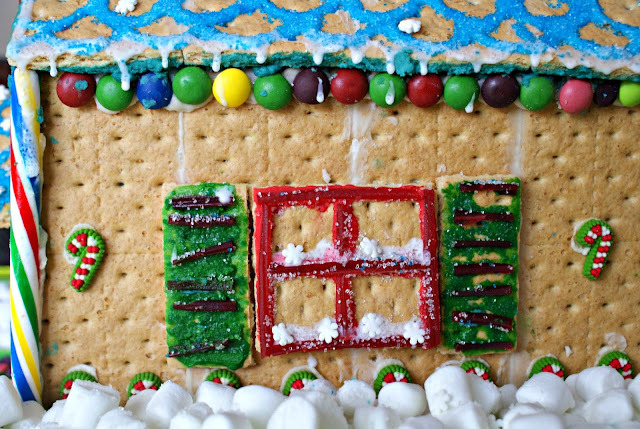 I recently found out about Taste of Home's Gingerbread Open House and decided that it would be fun little holiday craft to put together with my little lady, who just so happens to not only love craft projects, but graham crackers, candy, and miniature houses as well. I really wasn't sure where to start or how to go about it, but what I did know is that I'm a pretty creative lady, so I should be able figure it out. With nothing but a picture drawn by my four-year-old as our road map, a couple of boxes of graham crackers, a handful of leftover Halloween candy, and a tupperware of icing from the freezer, I'm happy to say that we pulled it off! And quite successfully, I might add! We did have a few mishaps along the way (I explain them below), but the outcome was a darling little house perfectly nestled in a yard full of marshmallow snow, complete with a cute little chimney, a cobblestone path, and icicles hanging from the roof-line. Just let your imagination run wild and remember that there's no wrong way to make a festive gingerbread house. Be creative, have fun and make some holiday memories with your family! You'll be glad you did. I know I am! First, we figured out how big each side of the house would be. We decided to use 4 graham cracker sheets for the sides and 2 for the front and the back. We also made a door, 2 windows, 4 shutters, 2 roof pieces, 2 triangle roof ends, and a chimney. I broke the graham cracker into the sizes I wanted and, using a sharp knife, I scored the graham crackers and broke them (which was surprisingly easy) to create the rounded top of the door and the triangle pieces for the ends of the roof. I then used my finger to apply icing to all of the seams and constructed all of my "parts". We then decorated them and let them lay flat to dry. I attached the door, windows, and shutters to the walls at this time, too, using globs of icing to make them stick. The icing hardened and acted as a glue. Attach the roof panels and let sit for a bit to make sure they aren't sliding off. 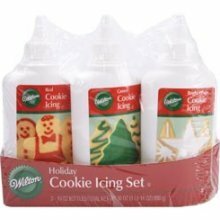 Finally, add any finishing decorative touches, such as frosting "icicles", marshmallow snow. Tip #1: Assemble your walls, decorate them, and let everything dry with the pieces laying flat for at least an hour BEFORE putting the house together. Otherwise, the wall pieces will come apart mid-construction and your icing and sprinkles will slide right off thanks to that little thing called gravity. Tip #2: Assemble the bottom part of the house and let it dry before attempting to attach the roof. The walls will be pushed apart from the weight of the roof if you don't let them dry first. Tip #3: Assemble your house over the course of 1 day. If you let the pieces sit out overnight, the graham crackers will soften and loose their rigidity, thus making it much harder to assemble them without them warping, crumbling, and bending in all the wrong places. I made the mistake of trying to attach the roof panels after everything sat overnight and in turn had to put a cardboard box into the house the keep the walls from bowing in from the weight of the roof. I also threw in a couple of graham cracker roof supports that are on the inside and can't been seen from the outside. Tip #4: Be liberal with your icing "glue". Trust me on this one. 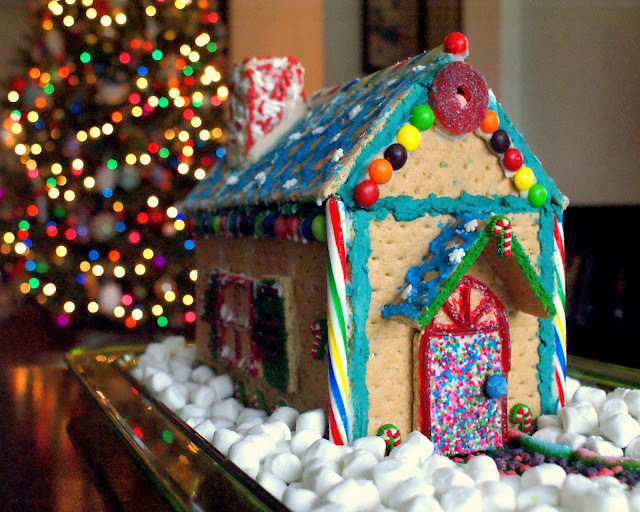 You need a sturdy structure to support all of that yummy candy decorations and the icing mortar is key! I tend to be a perfectionist, wanting everything to be neatly lined up and square. I had to remind myself that making a graham cracker gingerbread house is not as serious as constructing a real life skyscraper. Make it your own! 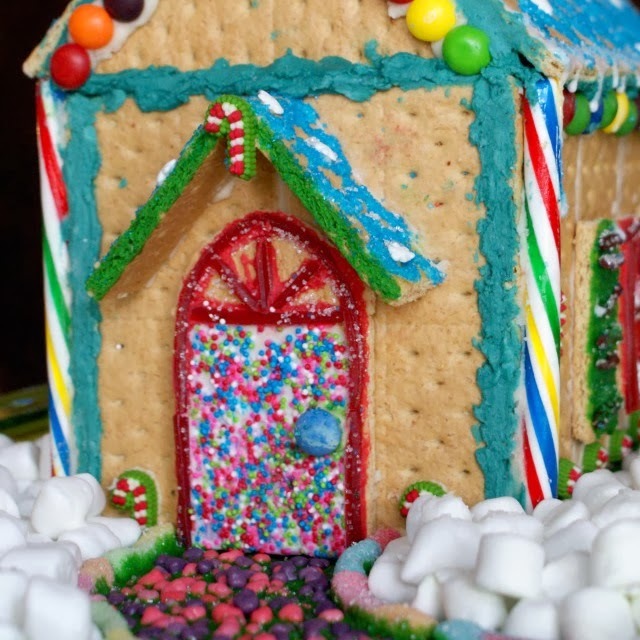 If you need some more inspiration on how to make your very own gingerbread house, check out the creations featured over on Taste of Home! They have lots of ideas and adorable little houses! You can also find another great gingerbread house recipe in the December issue of Taste of Home Magazine, on newsstands now or digitally by clicking here. I hope you will add your wonderful creation to my gingerbread house tour at Katherines Corner. Hugs! Thank you for sharing at the gingerbread house tour. Hugs and happy new year wishes!